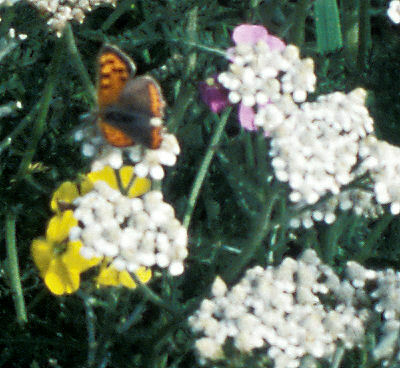 Achillea millefolium - the wild form of the Yarrow family is attractive to some of the less common butterflies that don't come to most garden flowers - like the Small Copper. It flowers all through mid to late summer, and its feathery foliage has a lovely aromatic scent when crushed. Hardy Perennial that competes well with long grass.